I don't know if it's because I'm a reading teacher or because I am a passionate reader, but I always love books about reading. This is a wonderful picture book because it is about reading, but also because it's about a girl, Madeline, who keeps trying even though she is challenged with learning to read. There is a message about persistence, but also about being confident in oneself. This book is a great addition to my collection of books about students faced with learning challenges, such as Thank You, Mr. Falker by Patricia Polacco and Fish in a Tree by Lynda Mullaly Hunt. I think young readers will enjoy reading about how Madeline read with a library dog and also be delighted by the surprise ending. The sweet, softly-colored illustrations will entice readers, as well. Josh Funk, the author of this picture book, is a pretty active on Twitter, so I feel like I somewhat know him, but it was nice to actually meet the real person behind the tweets at the ILA conference I attended last week. 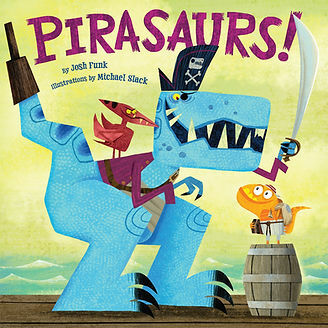 Pirasaurs is a fun, rhyming book that tells a story of dinosaurs who are pirates, a combination that is sure to please students. There is quite a cast of pirasaur characters, with one in particular who will win the hearts of readers with his determination and problem-solving skills. One of the reasons I enjoyed reading this book, similar to the reason I enjoyed Josh's Lady Pancake and Sir French Toast is the wonderful vocabulary that brings the story to life. I particularly loved the line, "I love to slurp and belch and burp with buccaneering beasts." Well, who doesn't? I think the story and illustrations will engage and amuse young readers. At the ILA conference last week I was also lucky enough to get an advanced reader's copy of the third graphic novel in the Hilo series. My students fell in love with Hilo when they read the first book and eagerly anticipated the second which they also loved. Of course, they've asked for the third book and been a bit disappointed to hear that, according to Amazon, the book will not be available until 2017. I almost felt like I had a piece of gold in my hands, as I walked out of the exhibit hall clutching my copy thinking about my reluctant readers, who until reading Hilo have never expressed much interest in reading, and all the students who will be excited to know I have the book. I imagine that my students will be hooked on this book in the first few pages since it contains humor, action, and mention of bodily functions. The adventures of Hilo, a robot who doesn't know much about where he came from, and his human friends, D.J. and Gina, continue in this book as they are trying to find their way back to earth. There's a surprise towards the end that opens up potential for an interesting storyline in a fourth book. This is a series that has engaged my readers and I just hope Judd Winick keeps them coming. Sometimes I am hesitant to read a book when there has been a lot of hype about it because I often expect too much and am a bit disappointed. There has been a lot of hype about this book, I did read it, and it turned out that it actually exceeded my expectations. This is a heartwarming story, one that may cause tears, but also smiles. When Ms. Bixby suddenly can't finish the school year because of a serious illness, three friends skip school in order to give her the last day she deserves. The story is inspiring and hopeful. I was pleasantly surprised that there were many parts of this story I found funny. This is a well-written story with a plot that makes you wonder and characters who are real and memorable. I highly recommend this one. I am only on the third chapter of this book, but it is already insightful and changing my thinking about what I know an essay to be. 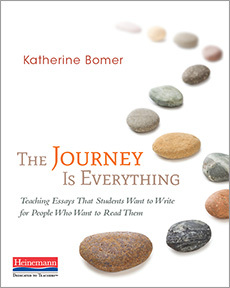 Bomer begins the book by presenting an essay and engaging the reader in reading it closely to explore the craft of essay. In chapter two, Bomer beautifully and wonderfully describes essay as "writing to think." I love the idea of writing essay in order to discover and learn more about what we think. Reading essay in order to write one is another important idea that comes across in Bomer's book. I'm looking forward to reading more of this one. I don't usually share my adult reading, but I have recently finished this novel and it is so beautifully written and such a captivating story that I have to share it. 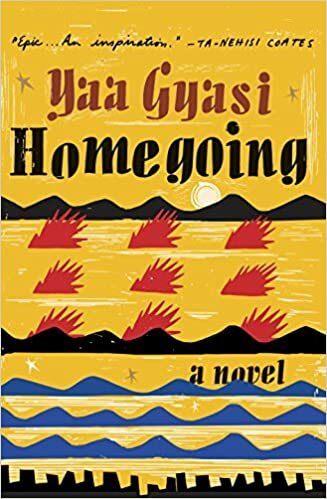 The story follows the family lineage of two half-sisters born in eighteenth-century Ghana with each chapter telling the story of a new character. With each new chapter and character, the story moves forward in time providing an insightful look at an important part of our history. The author tells a very powerful story. Josh read Pirasaurs to my class on a Skype visit and they loved it! Thanks for sharing the other books. I'll definitely add them to my TBR pile. That must have been so fun! Glad you got some titles to add to your reading list! Thanks for introducing me to the Hilo series! I am going to have to get a few copies! You definitely need to get get copies! No problem about the name - Laura, Lisa, it's practically the same name! :) It was great to meet you. Enjoy the summer as well! I was given Homegoing as a retirement gift. I'm glad to hear that it is a good read. I try to have read one adult book at least a month but I want to make sure it is worth it. 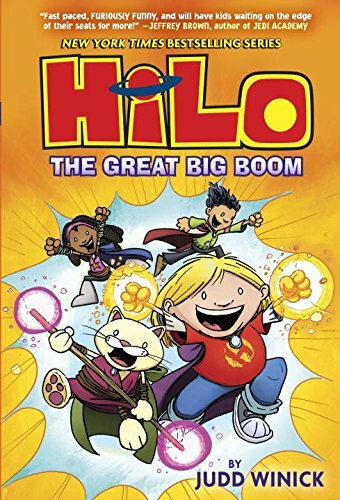 I"m glad to hear there is a new Hilo book. I'm sure our readers will love it since the last one was a definite hit. I feel that way about reading adult books, too. I read lots of reviews before I pick a read for myself because I want it to be good, too. I think students will love the third Hilo book as much as the others. Homegoing does sound lovely, so will put it on my growing list, Lisa. I did love Ms. Bixby, too, and have gotten the librarians reading it, too! Thanks for sharing the new Josh Funk, too, sounds like a cute book. I enjoyed Lady Pancake a lot. Will look for Madeline and the Library Dog when it comes out! Ms. Bixby is definitely a book worth sharing with others - it's just so great! Too funny! Authors are like celebrities to me! My first OMG moment like that over an author was when Ralph Fletcher friended me on facebook. I love the connections that can be made through social media! I'm definitely looking forward to reading Pirasaurs! Josh Funk is so much fun and Lady Pancake and Sir French Toast were very popular with my students. Have a terrific week! Thanks for checking out my list. Enjoy the week as well! 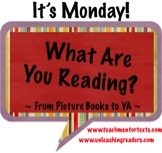 Almost everything here is on my TBR list! Super jealous you got an advanced copy of Hilo 3! I just finished number 2, love that series! I just can't wait to share it with my students!